In Congo, Rebels Take Key City : The Two-Way United Nations peacekeepers mostly stood aside as M23 rebels took control of Goma. The fighters are now vowing to move toward the country's capital, Kinshasa. 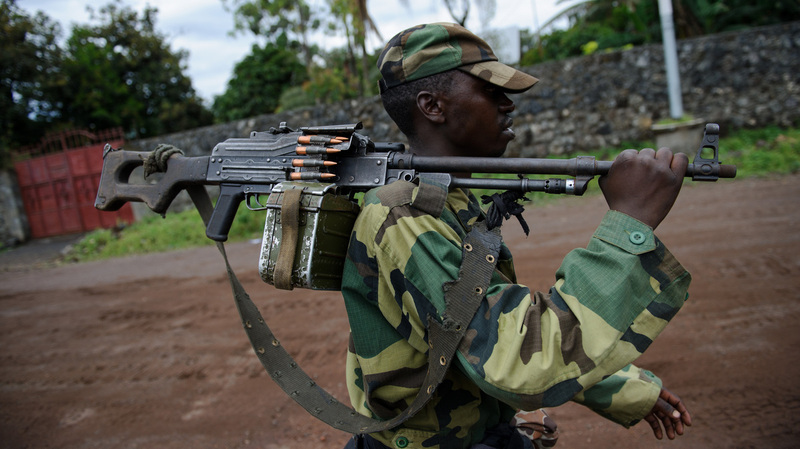 A M23 rebel in the streets of Goma. After some of the worst fighting in recent years in a country where war is all-too common, rebel forces have taken control of the "strategic eastern city of Goma" in the Democratic Republic of Congo. The rebel forces, who Congolese officials allege have support from Rwanda, have vowed to "liberate" the nation "by moving to the town of Bukavu and then marching on the capital, Kinshasa, hundreds of kilometers away," Reuters reports. The BBC's Barbara Plett writes that "the U.N.'s failure to confront insurgents who seized a strategic city in the Democratic Republic of Congo on Tuesday has raised questions about its largest and costliest peacekeeping mission. The blue helmets gave up the battle for Goma in the eastern part of the country without firing a shot, standing aside as M23 rebels — widely believed to be backed by Rwanda - overran the frontier city of up to one million people." M23 Col. Vianney Kazarama was greeted with loud cheers from civilians who gathered at a stadium in Goma, NPR's Ofeibea Quist-Arcton reports from Accra, Ghana. She adds that "Congolese President Joseph Kabila and Rwanda's leader Paul Kagame are holding talks in neighboring Uganda. Both Rwanda and Uganda deny accusations they're backing Congo's rebels."